Mission Stray Cattle is a unique social movement where city administration and society comes together to provide shelter to cow dying of hunger and eating municipal waste. A New Home for Stray Cows Provided by Police Adminstration of Hisar District by taking help of Donations from Society. Launched just a few months ago with the help of members of the Gauseva Samiti. More than 1100 stray cows provided suitable shelter in various gaushalas of the area. Over Rs 60 lakh so far through donations from industrialists, government servants, retired persons, social organisations, associations, schoolchildren, etc..
Money is being used to buy fodder for the cows in the gaushalas. 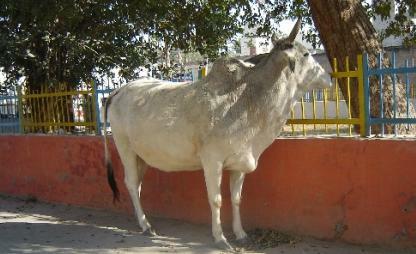 Rs 6000 per cow annually to ensure a regular supply of fodder. Future Plan: a modern gaushala, complete with a veterinary clinic and Bio-ga (gobar gas plant) as an example for others. Hisar deputy commissioner requested for allocation of the 600 acres owned by the Government Livestock Farm in Hisar for the gaushala. Panchayats have been requested to provide shamlat land in villages be given on nominal rent to gaushalas for growing fodder on a cost- effective basis. Mr Shrikant Jadhav, former Senior Superintendent of Hisar(Haryana, India) thought of launching the campaign when he visited an accident site where four officials of the Horticulture Department lay dead, trapped inside their jeep. Accident was caused due to stray cow on the road. He thought of providing the rightful place to the cow. One can help stray cows who are forced to eat garbage by donating a sum of Rupees 6000, which covers expenses of 1 year for a supporting a cow with food & shelter. Submit your views on Mission Stray Cattle.